What we need, says Nikiforuk, is a radical new emancipation movement that confronts the most pressing challenge we face: learning to use energy on a moral and truly human scale. Next Wednesday, November 28 is the annual Spirit of Red Hill Valley lecture. 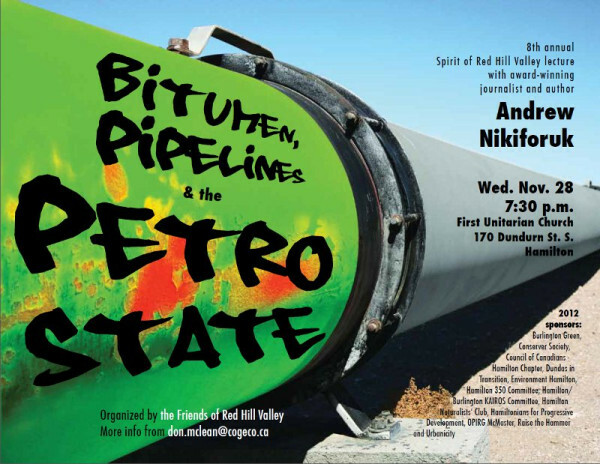 Acclaimed investigative journalist and author Andrew Nikiforuk will speak on "Bitumen, Pipelines and the Petro-State". Nikiforuk is an award-winning Canadian journalist whose work has been published in the Toronto Star , the Globe and Mail , Saturday Night , Macleans , Canadian Business , Report on Business , Chatelaine , Alberta Views , Equinox , Alternatives Journal and Canadian Family . He is the author of several books, the most recent of which is The Energy of Slaves: Oil and the New Servitude , published September 2012 by Greystone Books. Today, many people in industrialized countries like Canada enjoy lifestyles as extravagant as those of slave owners. We feel entitled to surplus energy and rationalize inequality, even barbarity, to get it. But endless growth depends on cheap energy, and our primary slave fuels are getting more expensive by the day. On Petro-States: "Oil booms engender not only spending mania but poor statecraft, ineffectual tax regimes, political extremism, and long periods of authoritarian rule."... "Petro-citizens possess a startling apathy and indifference to political affairs and a disconcerting loyalty to their petro-masters." On Cities: "By any definition, the modern city has become a human feedlot, an energy hog, and a carbon bomb." On Economics: "Oil has powered an unprecedented set of illusions: that exponential growth is normal; that self-interest is always rational; and that capital is disconnected from material resources. A once distinguished moral philosophy has degenerated into a bogus science whose experts offer predictions more inaccurate than daily weather forecasts." On Consumers: "The people on fossil fuels, perhaps the most narcissistic and bankrupt cohort in the history of the species, shop incessantly and genuflect to the market or the state, the provider of goods and services." On Over-population: "If coal was the Spanish Fly of the nineteenth century, then oil surely served as the Viagra of the twentieth." On Oil: "Most people don't regard oil as fuel for energy slaves, but that's what the master resource has become. Thanks to the work now performed by energy slaves, North Americans behave, think, and often look like obese, overbearing plantation slave owners." The sponsors for this year's Spirit of Red Hill Valley lecture are: Burlington Green, Conserver Society, Council of Canadians - Hamilton Chapter, Dundas In Transition, Environment Hamilton, Hamilton 350 Committee, Hamilton/Burlington KAIROS Committee, Hamilton Naturalists' Club, Hamiltonians for Progressive Development, OPIRG McMaster, Raise the Hammer and Urbanicity. I was sitting in the Homegrown a few day ago, having a coffee and read a article in the dominion aboout bitumen. It is a very toxic item and in mind it is completely unethical that we are extracting this stuff, to sell on the open market. I think what is going to take for people to change their habits? I heard today, that all coastal protection services in the US and even Canada have been eradicated, which sounds like de-regulation, so that big oil can continue on its destructive path. Very interesting, same old concepts that keep getting regurgitated but that is what is needed for sure. Hats off to these guys who have a real passion and message for this. Attended the lecture last night, it was highly informative and all the damaging signs mentioned about the various Petro-states are there to see around the world. It appears that landlocking the tarsands are the only way to slow down the madness and get a honest discussion going. But criticizing Alberta nowadays is as dangerous as talking about Quebec used to be!